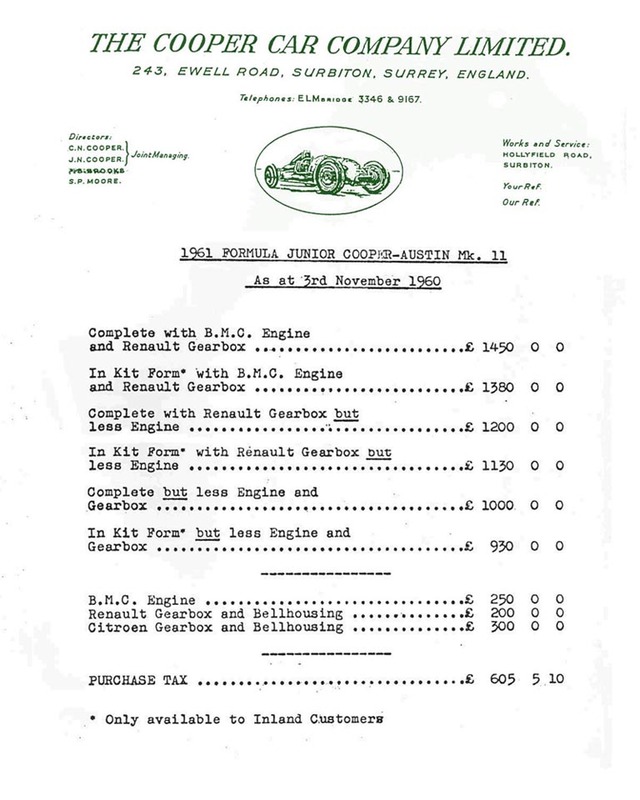 Formula Junior Price List 1960. 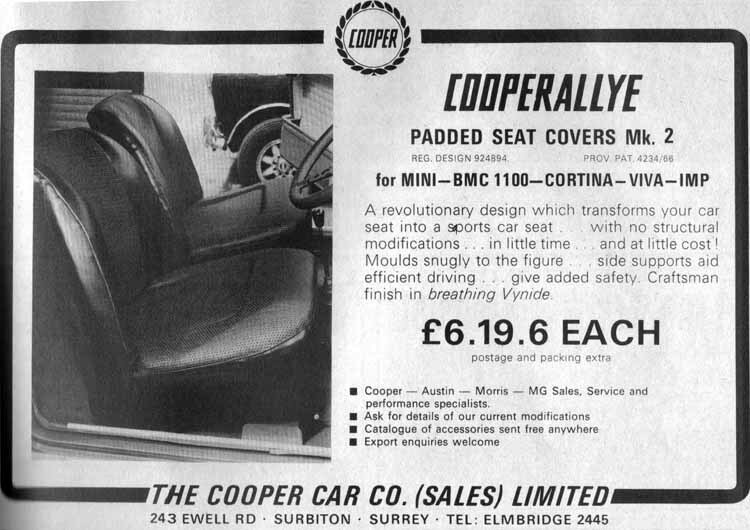 Before the Mini came along, the Cooper Car Compnay had forged quite a reputation in the manufacture of small lightweight single seater racing cars. It was an engine from one of these cars that was fitted into a standard Mini some time in 1960 that eventually lead to the Mini Cooper. Here's a price list for Cooper Formula Junior racers from 1960.
Cooper Formula Junior Brochure 1961. This is the brochure for the car described above. 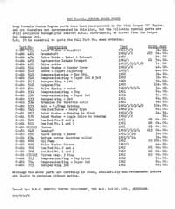 Comprehensive Formula Junior Parts List 1960 - 1964. This may not be of much interest to Mini fans, but I am very pleased to be able to add a comprehensive parts list for the Formula Junior Coopers. 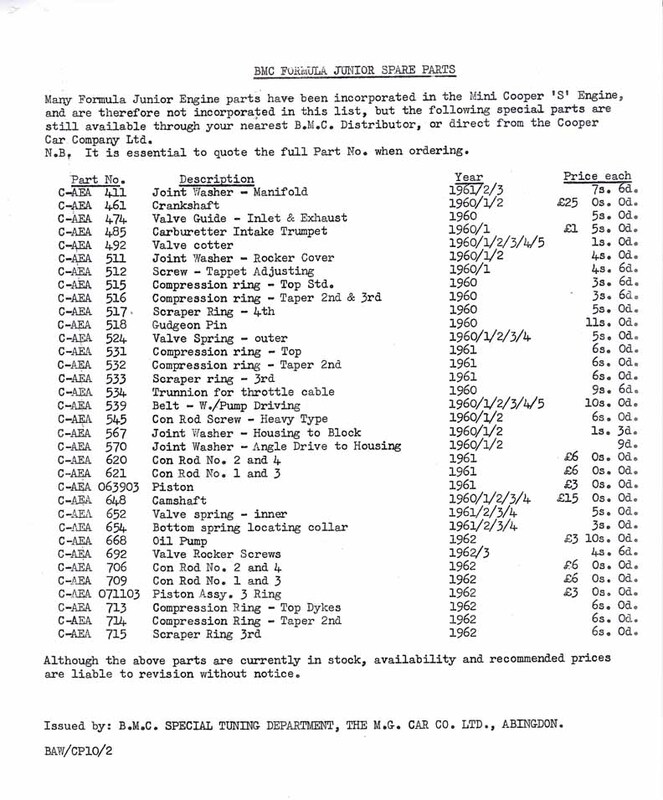 This parts list covers all Cooper manufactured FJ models from 1960 through to 1964. I would like to thank Ian Garmey from NZ for allowing me to add this very interesting & rare item to my site. Thanks Ian! The Parts list is a 3Mb PDF download that will print very well for further reference. 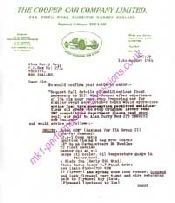 Letter Regarding Mini Tuning Dated 1964. This letter is a fantastic reminder as to how straightforward everything was in the early & Mid 1960's. The specification given for the car in this letter, is pretty laughable even when judged by the standards of a couple of years later, but the fact is that in 1964 you could build yourself a very competitive circuit racing Mini with very few trick bits at all. "Golden Years 59 - 60". A fantastic promotional brochure produced by the Cooper Car Company celebrating their Golden years 1959 & 1960. Thanks to Mark Featham for this very, very rare copy. Cooper Type 72 Formula 3. 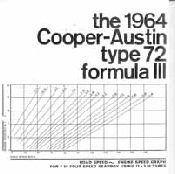 This interesting brochure gives details of the power output of the Cooper-Austin Type 72 F3 single seater. BMC Formula Junior Short Form Parts List. 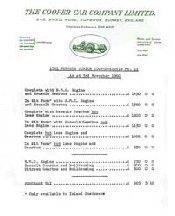 A short form parts list giving details of the FJ spares available through the BMC Competitions Department. The company that started it all off. Of all the tuning establishments that traded on their success with the Mini the most famous of all is The Cooper Car Company. Founded by Charles Cooper in 1947 Coopers developed an enviable reputation for the manufacture of small rear engined racing cars. Through the 50's & early 1960's they became an enviable force to be reckoned with in the very highest level of Motor Sport, winning the World Championship in 1959 & 1960. There are far more comprehensive sites dedicated to this small Company from Surbiton, what I offer here is just a taster. 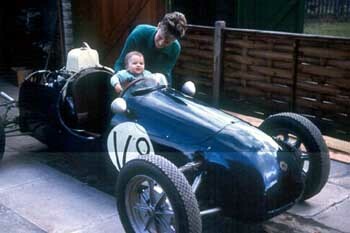 The image above is me at the wheel of my Father’s Cooper 500 in summer 1965.